Imagine yourself catching an early train, headphones in, watching the sun rise as the buildings flutter by. At your stop, you walk a few blocks toward the beach, as the morning’s waves get louder in your ears. Your first shower is the seaspray as you ride your board over the day's first wave. This can be yours and you'll still make it to work by 10 a.m.
Surfing in New York City is alive and well. It’s no longer exclusive to bleached beach-bums and their afternoon siestas – not to knock a rad lifestyle. Over 2.5 million Americans surf annually. It’s an increasingly diverse sport, whose largest segments of growth are young professionals and women. Surfing is a fantastic workout, a commune with nature’s rawness, and a zen-like connection between you and the water. Why should you surf NYC and its nearby coastal beaches? Proximity to the city, combined with abundant rental shops and experienced instructors, will have you up on a board in a day – but hooked for life. Surfing is a lifelong sport for millions across the globe. Photo by FGMsp via Pixabay. Nobody expects you to be up on a board on your first few runs. If you’re looking for something one-on-one, it’s possible. Enjoy learning with others? Try your hand in an adults only session. Women’s, children’s, and singles classes help connect surfers in deeper ways. Surfing is turn-based. Paddle out and queue for your time to ride.“Dropping in” on another surfer’s wave isn’t suggested. One rider per wave, to avoid collisions. Be friendly and you’ll find helpful locals will make it a great experience for you. Beginner boards and wetsuits are available for rent at local shops. The longer and softer the surfboard, the easier it is to control. Wetsuits are often necessary in the cooler waters of the northeast Atlantic. Underneath your suit, a bikini top or rash guard (a light synthetic t-shirt), and some swim bottoms. Beginners should look for 2-4 foot high waves –thigh to ribcage high– that roll in one direction, and don’t collapse in the middle. Windy conditions can cut down on wave quality, a.k.a “chop”. Where to Surf Near NYC? Now that you know the ins and outs of surfing, let’s head to the best beaches in and around NYC. Read on! The NYC Parks department sets aside three dedicated beachfronts to surf in the Rockaways: between Beach 68th and 71st streets, Beach 87th and 92nd streets, and a new stretch of shore between Beach 110th and 111th streets. Frank Cullen, owner of New York Surf School in the Rockaways, has deep roots in NYC’s surfing scene. Over the course of four decades, he’s personally put over 10,000 people on boards. What makes surfing in Queens unique, Cullen mentioned, is the people, not the conditions. “The surfers that make up the Rockaway surf community are basically the people who make up New York City,” Cullen said, referring to the sport’s local diversity. The Rockaways is a perfect spot for city surfers on their first excursion. Its forgiving waist-high waves help beginners focus on fundamentals. There are stretches of beach set aside so surf schools don’t have to fight for space. In the end, everyone’s chasing the same goal: standing up and having a fun ride. It takes practice, but most get there in their first session. “It’s such a truly amazing experience. I relive it every time I see a new person do it.” Frank said, asked about the first time he got up on a board. Surfing is more than just a sport, it becomes an actual lifestyle”, Cullen said. In the Rockaways, you’re another New Yorker – with more sand in your curls and crevices. Cullen’s New York Surf School even offers “Singles Surfing Retreats” if you’re looking for a place to meet someone other than a bar. When it comes to surfing, long live the Queens. To reach the Rockaways, take the A train toward Far Rockaway. Take the Prospect Expressway to Shore/Belt Parkway East. At Exit 11S take Flatbush Ave south over the Marine Parkway Bridge to Shorefront Parkway. 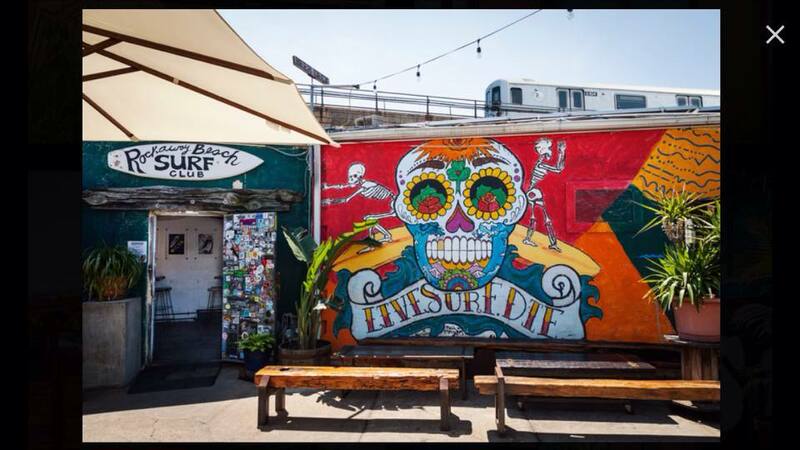 A surf-vibe cantina with tacos and Mexi-beers. If you're looking for the perfect post-surf vibe, RBSC is it. Free. There are no fees or permits needed to surf in the Rockaways. Private, group and surf schools available. Saturday singles surf meetup. Beach 69th St, Arverne, NY; (718) 496-3371. 192 Beach 92nd Street, Rockaway Beach, NY; (718) 318 7997. There are ton of Long Beaches to surf in the world – even a spot in New Jersey. NYC’s own Long Beach surf scene is just miles away on Long Beach Island, east of The Rockaways. You can rent a bike and spend all day along its recently rebuilt boardwalk. Even whale watching if the season is right. The Island’s south shore is split into a few main beach areas, but the most popular beach to surf is Lincoln Beach – straight down to the beach from Lincoln Boulevard. Its surfing zones are marked by yellow flags and watched by lifeguards who will point you in the right direction. Lido Beach, to the east, is a another option if you’re looking to escape the summer crowds. Landforms and sea bottoms contribute to local wave quality. These structures are referred to as breaks. Beach breaks have sand bottoms and are more forgiving for beginners. Reef or Rock breaks create abrupt, curling waves, but add sketchy seafloor obstacles. Point breaks create long rides as the incoming swell deflects off a local point or structure. Local surf shops are happy to answer questions if you're unsure of their beach's conditions. Localism describes the relationship between locals who’ve surfed these beaches for years, and new surfers visiting a beach for the first time. Many New York sports rely on high-traffic shared space – outdoor basketball courts, for example – and it’s important to brush up on etiquette and local rules. To rub elbows with the good eggs, finish your day at Riptides – a true surf bar complete with hammocks and cold buckets of Mexi-beers. If you’re lucky enough to catch a sunset from your hammock, you’ll see why it’s hard to return to a “normal” life. From Penn or Atlantic Terminal, Take the LIRR Long Beach line to its final stop, Long Beach Station. Take I-495E (BQE) to Exit 22A, heading south on I-678/Grand Central Parkway. At Exit 1, merge onto NY-878E/Nassau Expressway. At Riptides, fan favorites like fish tacos and lobster rolls will help you regain your energy. Wash them down with something frosty. Purchase a pass on the Boardwalk. VISA/Mastercard/Cash. $12 per day for residents, $15 for visitors. Children 12 and under are free. Private, group and surf camps for kids. Long Beach Blvd, Long Beach, NY; (516) 318-3993. Call ahead, walk in or rent online. 359 E Park Ave, Long Beach, NY; (516) 889-1112. 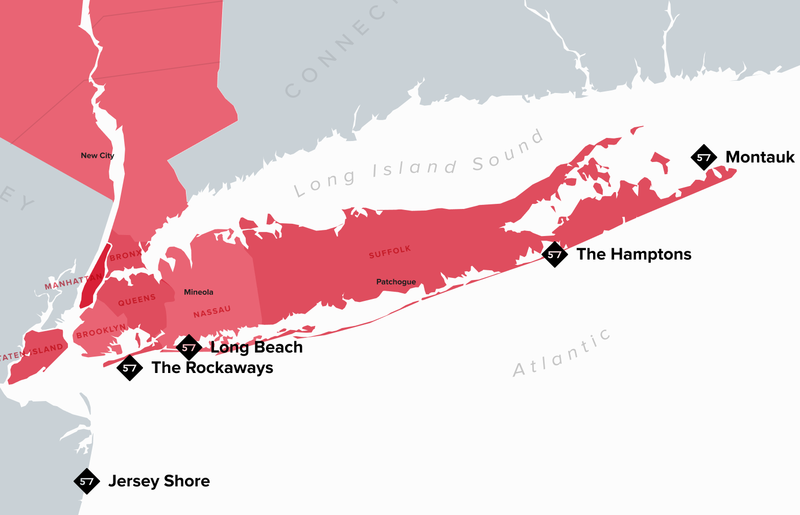 After extensive damage from Hurricane Sandy – and to some extent, MTV’s “Snooki” era – the Jersey Shore has reclaimed its proper spotlight as the longest stretch of publicly accessible beaches in the world. Its arcades, fun parks, and boardwalks provide entertainment for thousands of locals a year. However, the real action is on the water. The Shore provides dozens of sunny surf locales and break features. A manmade jetty in Sandy Hook creates long-ride conditions in “The Cove”. Belmar’s consistent beach break is a mecca for surfers of any level. Its next-door neighbor, Manasquan Beach, churns up 4-10 foot waves depending on conditions, so there’s something for every skill level. What Makes the Jersey Shore Different? These periodic waves from offshore winds are called swell. Good waves aren’t hard to find along 130 miles of quality beachfront. Surf forecasting sites and beachfront webcams give surfers a quick peek at the waves. 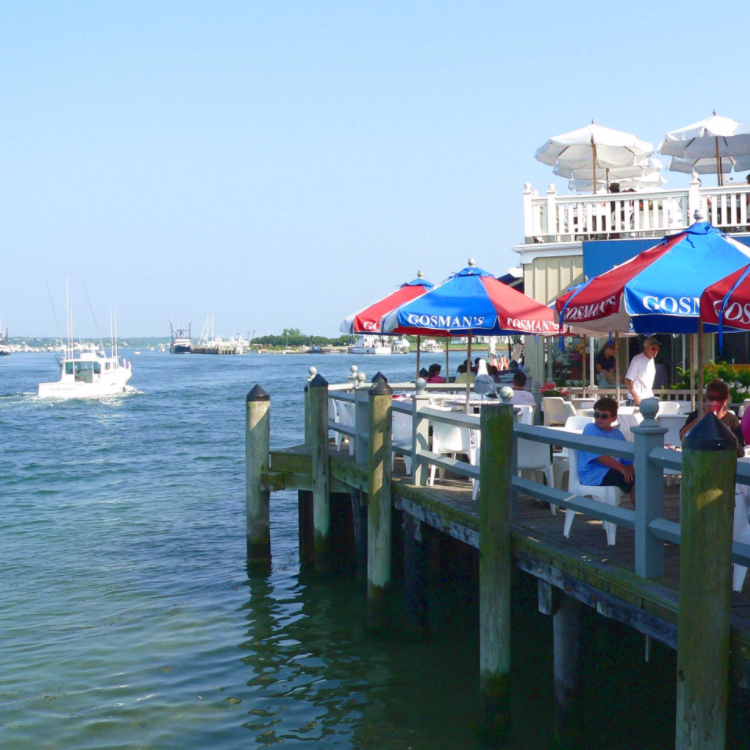 This is how Shore residents scout the best daily spots without the guesswork. Due to their coastal alignments, the Shore and New York don’t see the same conditions every day. An interesting exchange takes place: NJ surfers head to Long Island on days when waves are primo, and Long Islanders will head down to the Shore on its best days. As long as there are decent waves, surfers will travel. From Penn Station, take the North Jersey Coast line to reach each of the best surfing locations in Northern and Central New Jersey. Take the Holland Tunnel to I-78W and take I-95S (NJ Turnpike). From Exit 11, merge onto the Garden State Parkway, which will give you multiple exits to head east to the Shore. Combining American fare and seafood, Mister C's is a fantastic place to grab post-surf protein. Beach-y cocktails and a great waterfront view for sunset. Most beaches have a daily fee of $5 to $10. Find passes along boardwalks at kiosks or local city halls. Private, group, and surf schools. Location based on lesson. (732) 599-2700. 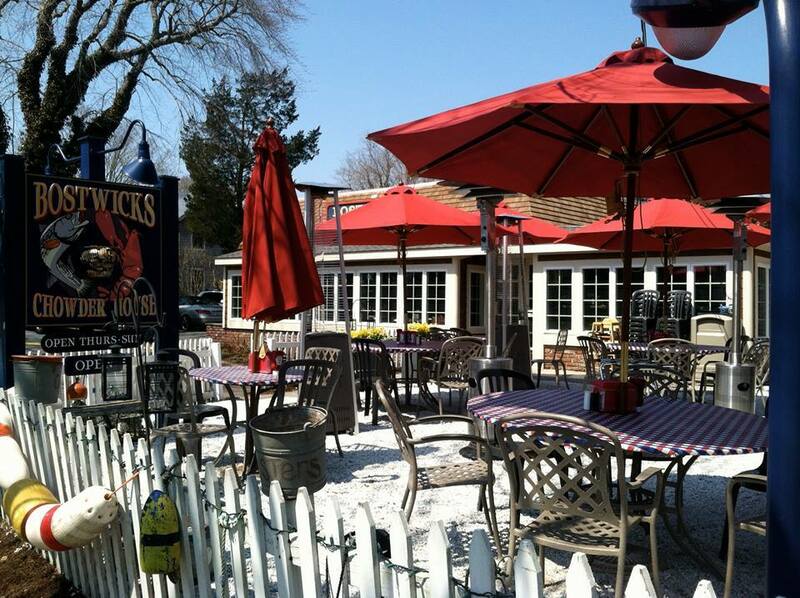 1208 Richmond Ave, Point Pleasant Beach, NJ; 732-899-8220. New York’s glamorous Hamptons region is home – or summer home, at least– to New York’s elite. Just ask George Costanza. Each summer, NYC denizens head east to break off their own slice of the good life on one of its multiple surfing beaches. You could bump boards with a billionaire beginner and never know it. Its beautiful coastal scenery make any effort to paddle out rewarding. For those brand new to surfing, Flying Point Beach in Southampton offers steady waves, beachfront amenities, and helpful lifeguards. Main Beach near East Hampton regularly tops “best beaches in America” lists for its beauty and fun seaside options. For surfers, Main’s beach breaks are forgiving to newcomers, but you can find sizable waves if you’re more experienced. For an advanced ride, head further east as the shoreline approaches the Montauk area. Wave height starting at 2-3 feet. A period of 10+ seconds between waves. Moderate winds from far offshore. Morning and evening high tides. “With Easthampton specifically, there’s not a lot of consistency with the shoreline … so you have to follow the sandbars around and drive around a lot to try to find a good spot,” George McKee, manager of Main Beach Surf and Sport, said. Surfing is the battle of will and physical endurance against extreme conditions. This hasn’t changed for decades. What’s the appeal to newer generations of surfers. I feel like surfing is back in the cultural zeitgeist,” McKee said. Take any LIRR line, or the E,J, or Z, east to Jamaica Station. Transfer to the Montauk Line, and hop off at Southampton, Bridgehampton, or Easthampton stations. Follow I-495 (LIE) to Exit 70 at Manorville (111S), which merges into Highway 27. Follow 27 to Southampton, Bridgehampton, or Easthampton depending on your beach destination. Free. Permits required for parking in certain lots, and non-resident permits sell out quickly. 352 Montauk Hwy, Wainscott, NY; (631) 537-2716. Montauk is New York’s ultimate getaway for surfers. In recent years Montauk made SURFER Magazine’s top 10 beach towns, a valuable endorsement which has driven more east coast surfers to try it out. It’s only three hours by train from the city, and provides a range of waves to ride. Montauk’s calm morning winds make sunrise surfing –known as “dawn patrol”– a must. The popular Ditch Plains Beach offers food trucks, showers, and friendly locals. Turtle Cove’s gorgeous eroded cliffs provide a picturesque paddle, but is better suited for experienced surfers used to gnarlier conditions. “Montauk has big rocky shoals, and has probably the most consistent waves on the island because nothing really changes … The waves always break the same exact way for as long as I’ve been surfing, at least.” George McKee, who also surfs and gives lessons in Montauk, said. Montauk’s historical and cultural contributions – shudder… Jaws – add some lore to the trip. You’ll be happy to know that there are zero recorded shark attacks in Montauk’s history. Its prominent, centuries old lighthouse and nearby state parks are worth a hike if you need to catch a breather on shore. From Penn Station or Atlantic Terminal, take the LIRR Montauk Line to Montauk Station, the last station stop on the line. Take I-278E (BQE) o I-495E. Follow I-495 (LIE) to Exit 70 at Manorville (111S), which merges into Highway 27. A relaxing waterfront scene to laze away the rest of the afternoon. 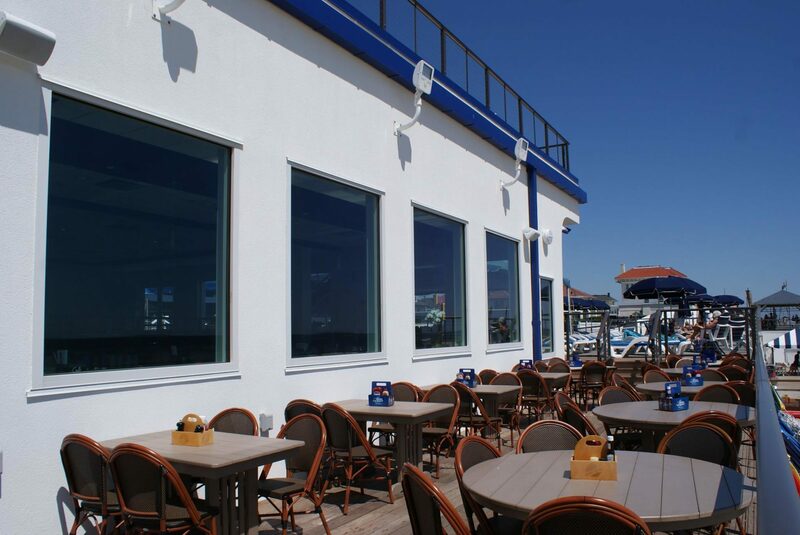 Gosman's can surf and turf, with giant lobster rolls, refreshing beachside cocktails, and other fresh seafood snacks. Free to surf. Parking at NYSP lots are $8 a day per car, grab a permit at Montauk Downs golf course. Park and walk available in Montauk proper. Private, group and surf school lessons. Recently featured on HBO’s “Girls”. Location based on lesson; (631) 603-8799. 795 Montauk Hwy, Montauk, NY; (631) 668-0356. Join Us in the Water this Summer! Surfing is arguably the easiest outdoor adventure sport to get into around New York City. Endless beaches and favorable conditions means there’s never a dull day on the sand. If you’re already at the beach, there’s likely a surf shop with rentals nearby. Lessons or not, your heart will skip a beat when you ride your first wave. Our own Perica Levatic took a morning lesson with New York Surf School. Read about his experience as a beginner on the waves. Looking for more opportunities to experience outdoor adventures in the New York region? Join our mailing list below for our latest guides, class recommendations, and new places to explore!